I was lucky enough to have spent 3 nights with Westjet and the Las Vegas Convention and Visitors Authority (LVCVA) and getting to see all this fantastic city has to offer. Over 100 agents from across Canada had been invited to join, which is the largest agent trip I’ve ever had a chance to participate in. It was a total whirlwind of a trip! I started this journey with a 6 am flight from Saskatoon to Vegas, through Calgary, with Westjet. Everything was on time, and ran without incident. I was greeted at the airport by a Westjet and LVCVA rep, and then shuttled to my hotel. 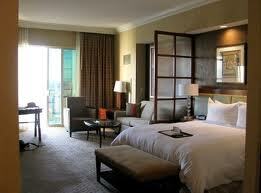 There are 4 different hotels we were split up into, and lucky me, I got to stay at The Venetian. I’ve never stayed at such a beautiful hotel – grand frescos painted everywhere, crystal chandeliers and marble floors. I was wowed once again in my suite, which was over 700 sq ft with a sunken living room, luscious king size bed, double vanity, soaker tub and 3 TVs. It almost felt like too much room for just one person. Group activities were planned for 5:30 on the first night, so after shopping I made my way back to the hotel to change. My group from the Venetian walked to the Wynn for a great reception hosted by the hotel management. Oh my, the Wynn is beautiful! The flowers in the lobby are flown in from Holland every 3 weeks or so, and they have a Ferrari dealership on site. I was blown away. During the reception we mingled with agents from across Canada, Westjet members, and tourist board staff. The food was amazing; I had a fantastic mushroom risotto, and an absolutely delicious Peking duck rice bun. The balance of the evening was free, but since I had been up since 4 am, all I could manage was a walk to Harrah’s before I had to turn around and head to bed. The next two days were full of events hosted by the hotels, Westjet and the tourist board. Tuesday we started out at Stoney’s Rockin’ Country bar with breakfast and a day of networking with different suppliers – hoteliers, attractions, golf, weddings and shows. 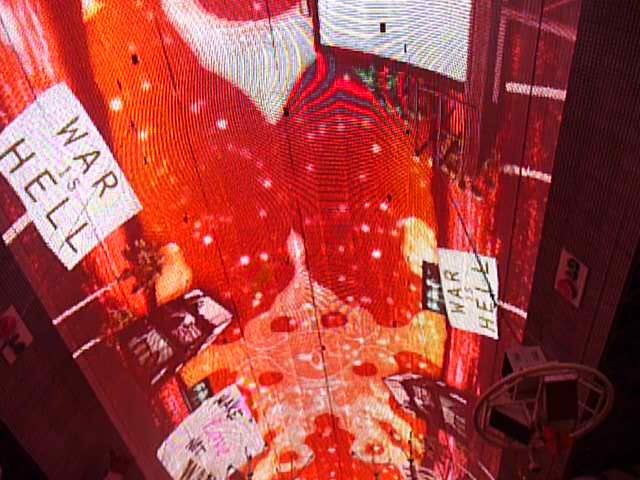 There are so many things to do in Vegas besides gambling, it’s impossible to fit them all in with just one visit. We ended the afternoon with a few beers and bull riding; however I was not brave enough to give it a go. A few people were, and I’m sure it’s a lot harder than it looks. I have poor balance on flat ground, so I had a feeling the bull and I wouldn’t get along. 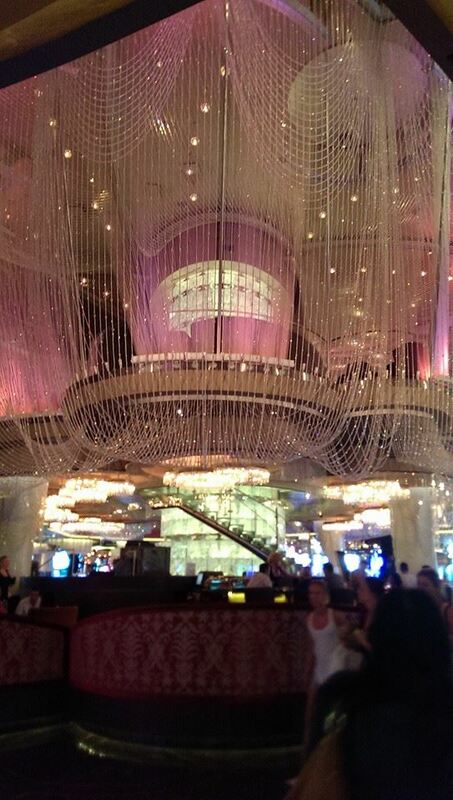 For the evening we had a reception hosted by the Cosmopolitan in the absolutely amazing Chandelier bar. It’s the largest chandelier in the world at 3 stories high, and made with over 2 millions Swarovski crystals. I was in heaven. 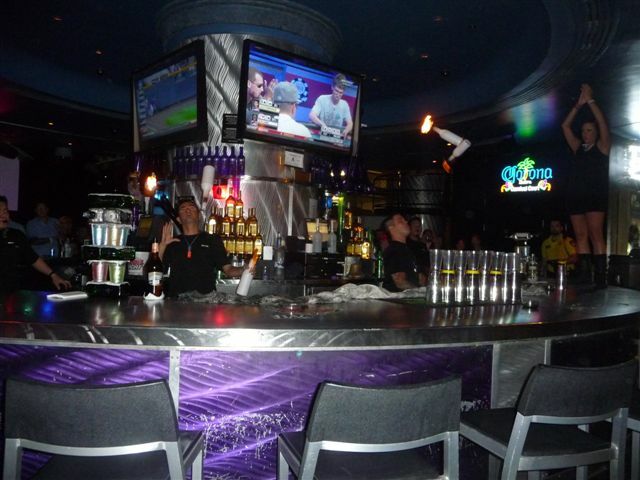 The service at the Cosmo was top notch, and the reception appetizers were delicious. I wish I had more time to explore the hotel. It’s very modern, and one of the few hotels on the strip where most rooms have a terrace. After the reception, we split into 6 groups to attend different shows or activities. I was with the group to the Cirque du Soliel show Mystere. If you have never seen a Cirque show, I highly recommend it as the acrobatics and athleticism is outstanding. The show was at 9:30, so by time it was over at 11:15, I was pretty exhausted. Since we didn’t have a huge meal prior to the show, I was on a mission for food. I wasn’t really up for sitting in a restaurant for 90 minutes for a full meal, so I went to the Grand Luxe Cafe at the Venetian and got a nice turkey sandwich to go, which I took back up to my room to eat. After a long day, it was nice to just relax in bed and catch some zzzzzz’s. On Wednesday, the group split up for the morning, and we each went to a different hotel for a site inspection. My group headed to Treasure Island, which luckily is just across the street from the Venetian. 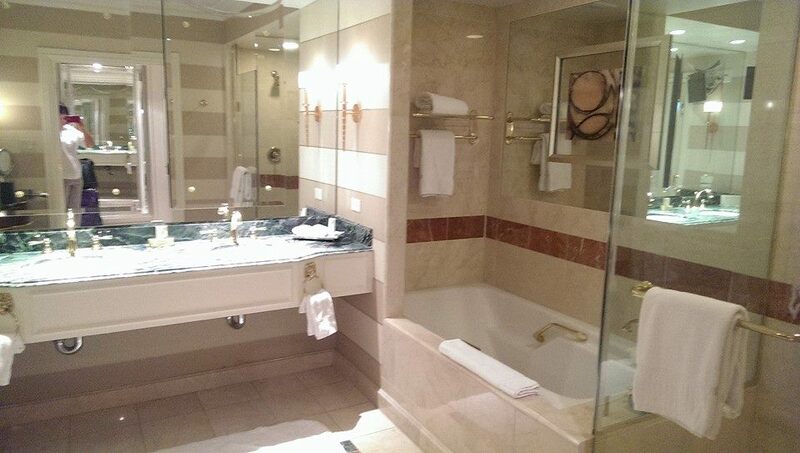 Another great hotel, TI is not part of any major chain in Vegas. It’s a “boutique” size hotel for Vegas, though it still has around 3,000 rooms, and most things are compact around the casino floor. They are also building a new shopping complex on the façade of the hotel, which should be opening this fall. We also had breakfast at the buffet here, which was delicious and offered something for everyone – made to order omelets, eggs benedict, hash browns, sushi, fruit, and an assortment of breakfast meats. 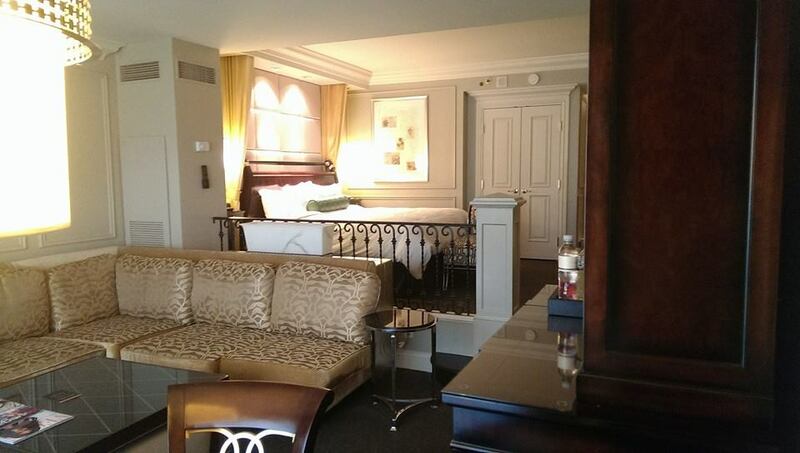 The hotel was at full occupancy, so we were only able to see one room, a petite suite. It’s a bit larger than the standard room, with a sitting area and split bathroom design, but the decor and general layout are the same. After we were finished at TI, we headed to the Monte Carlo to meet up with the other groups for lunch and games hosted by MGM resorts. Lunch ended up being only about 2 hours after breakfast, so I didn’t have anything but a small sandwich. MGM hosted their own customized version of Scene It, which is trivia game about movies. They gave out prizes with complimentary hotels stays, but I was not a lucky winner. I guess I’m not as good with movies as I thought I was, but it was still loads of fun. Afterwards we were split into groups again for another activity. I chose a visit to the Mob Museum and a ride on Slotzilla, which is the newly renovated zip line on Freemont. The museum was great, but I definitely could have had more time there. We had just under an hour, and I probably could have spent three. 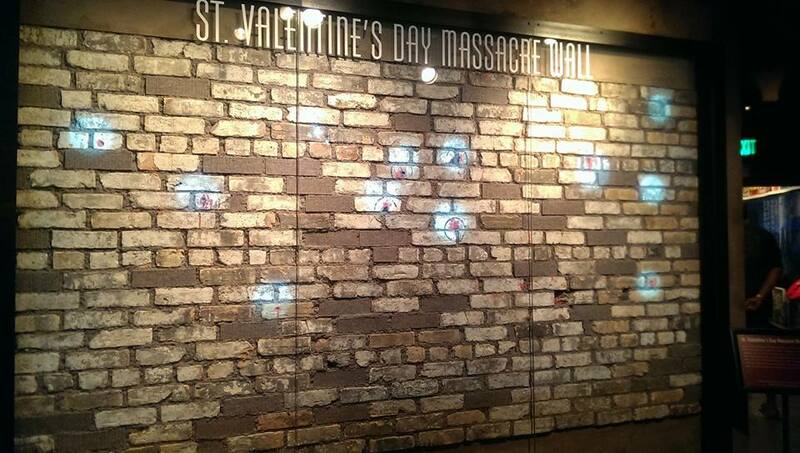 There is everything from Al Capone, Bugsy Siegel, Frank Lucas, and Lucky Luciano, to a piece of the wall from the St Valentine’s Day massacre, history on the mob in Vegas, and different movies based on mobsters. It made me want to go home to watch Casino and American Gangster. With a few free hours that afternoon, I decided to go check out the Miracle Mile Shops at Planet Hollywood. With over 170 stores, there is something for everyone. If you love to shop, be sure to pick up one of the discount coupon booklets, which are worth over $2,000 in savings. The coupons don’t expire right away, so you can use it again or give leftovers to a friend who is going later. For the third and final night, we headed to the Flamingo for dinner at their steakhouse, Center Cut. What another great meal! We started out with a seafood platter, which had crab legs, shrimp and oysters. I’d never had an oyster before, so another agent showed me her way to eat one – lemon juice and Tabasco. It wasn’t awful, but I don’t think its top on my list to order again. The rest of the meal however, I could eat every night. A Caesar salad to die for, grilled asparagus, mashed potatoes, and a fillet mignon that melted it my mouth. My mouth is watering just thinking about it again. As dessert was being served, a few speeches were made by Westjet and the LVCVA, when a surprise visitor came by – Donny Osmond! He was just stopping by the restaurant kitchen to get a salad before his show, and decided to come in and say hello. What a great way to end dinner! For one final activity, we had a ride on the High Roller, which is the newly opened observation wheel. At 90 feet taller than the one in London, it’s the largest observation wheel in the world. The ride is approximately 40 minutes, and the views are amazing. 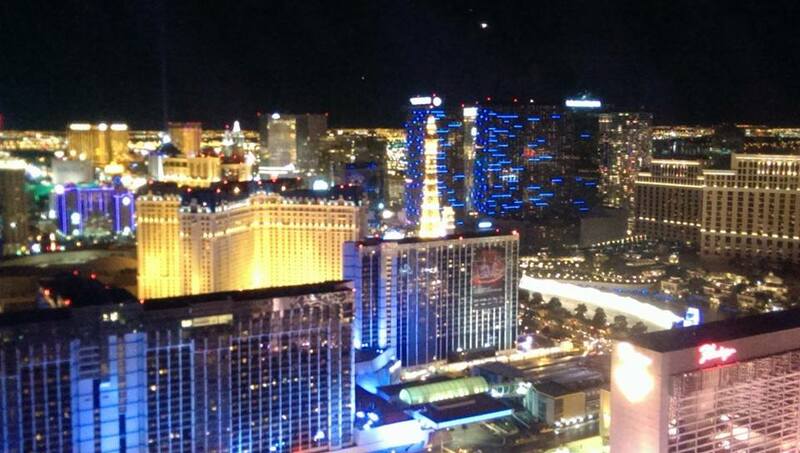 At night you can see all the hotels lit up, the Bellagio fountains, and the city all around you. It’s just breathtaking. Each capsule holds up to 40 people, and they can even be booked for private functions and weddings! So thus ends the night and now we had to part ways. Unfortunately I had the earliest flight back home the next morning, so I had to miss the breakfast windup. I said my goodbyes to the Westjet reps and the many new friends I’ve made, and made my way back to my room to pack. I can’t wait to go back to experience something new next time. Viva Las Vegas! Until we meet again.